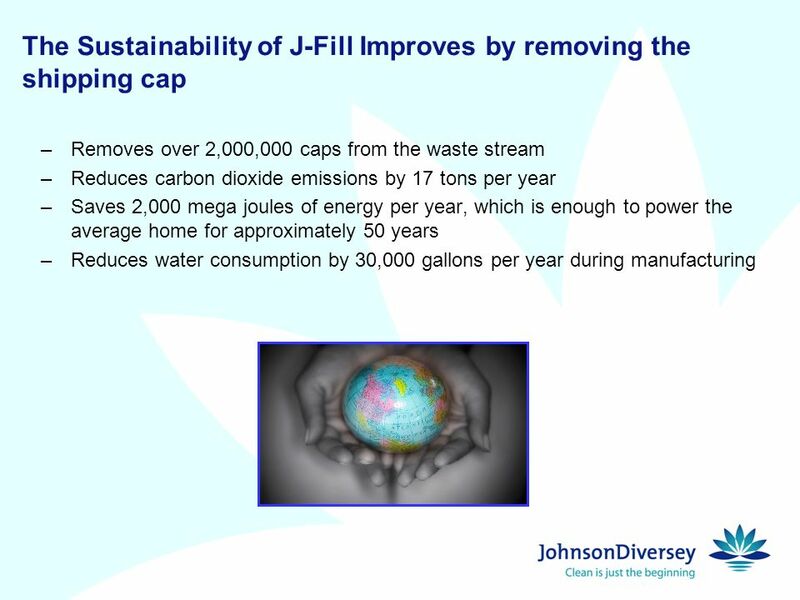 J-Fill® Shipping Cap Removal Improving the Sustainability of the J-Fill Platform January 19 th, 2010. 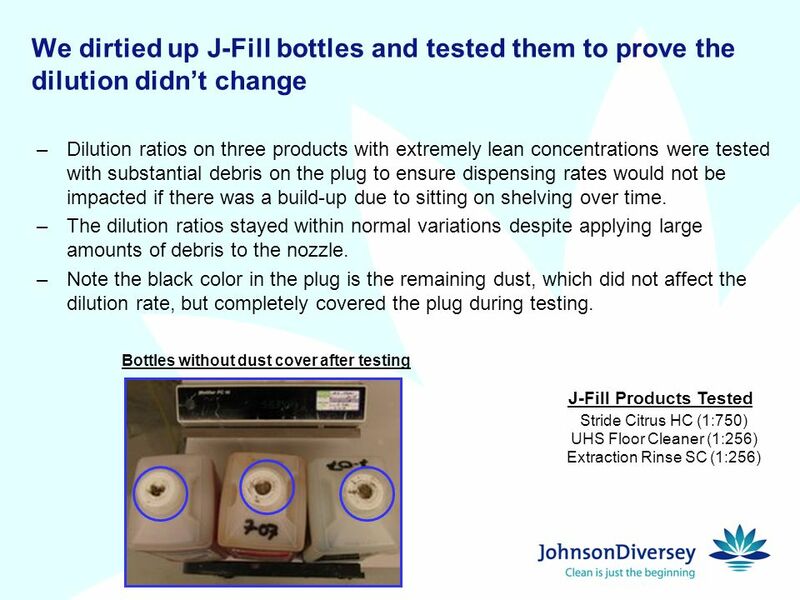 2 J-Fill is the industry leading dispensing platform, but theres always opportunities to improve –Best dispensing system in the industry with its patented design. 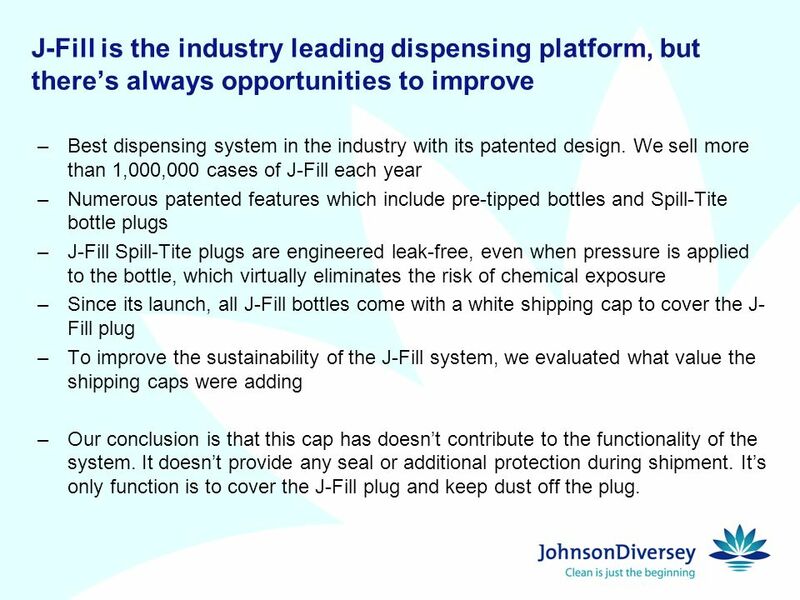 We sell more than 1,000,000 cases of J-Fill each year –Numerous patented features which include pre-tipped bottles and Spill-Tite bottle plugs –J-Fill Spill-Tite plugs are engineered leak-free, even when pressure is applied to the bottle, which virtually eliminates the risk of chemical exposure –Since its launch, all J-Fill bottles come with a white shipping cap to cover the J- Fill plug –To improve the sustainability of the J-Fill system, we evaluated what value the shipping caps were adding –Our conclusion is that this cap has doesnt contribute to the functionality of the system. It doesnt provide any seal or additional protection during shipment. 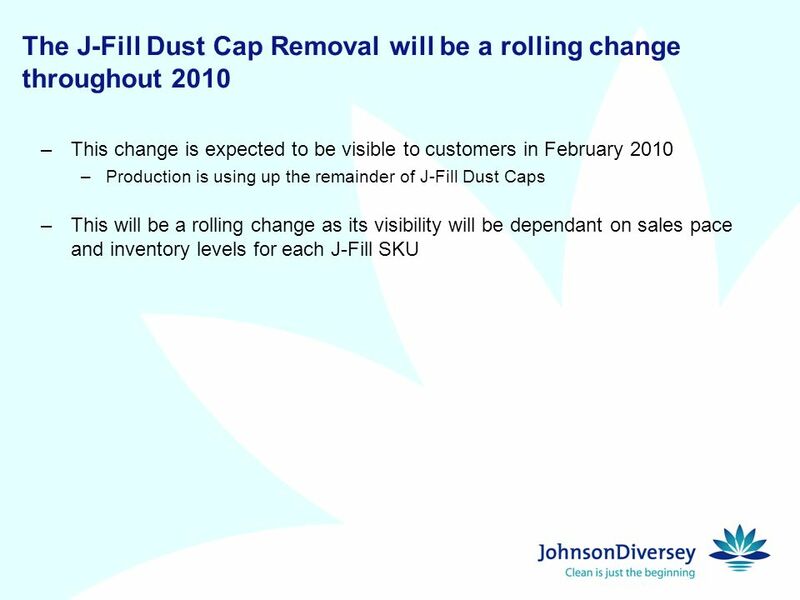 Its only function is to cover the J-Fill plug and keep dust off the plug. 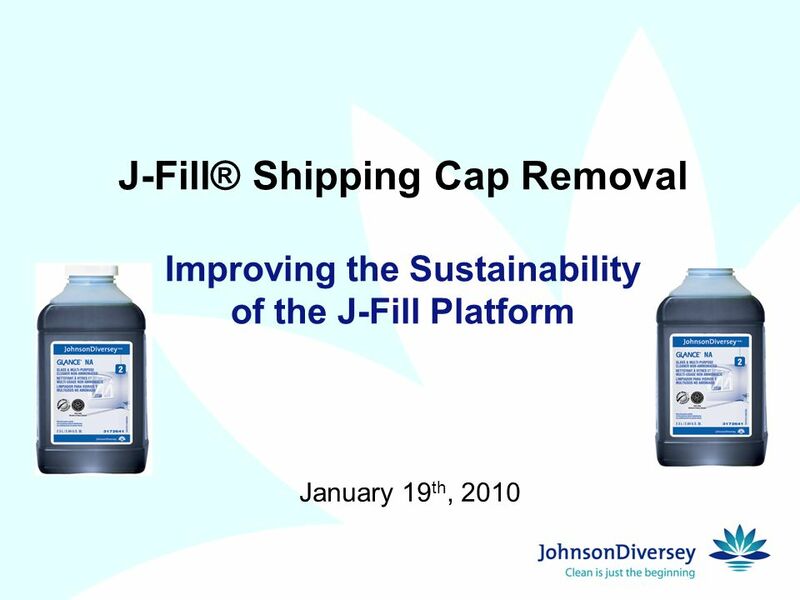 Download ppt "J-Fill® Shipping Cap Removal Improving the Sustainability of the J-Fill Platform January 19 th, 2010." Green Impacts of Public Transportation on our Communities Help Florida Turn the Corner with Transit. Marketing Marketing Process - analysis, planning, implementation, and control of marketing Analysing- Society becoming more environmentally friendly. New. Hoshizaki America has built a legacy of quality design, reliability and customer commitment. In our Commercial Series refrigeration line, youll see solutions. Materials Management and Climate Change An Introduction. Petra Rubber Powder Industries Ltd. The greener way to move forward. Home Cooling EGEE 102. EGEE Pisupati2 Function of an Air conditioner. 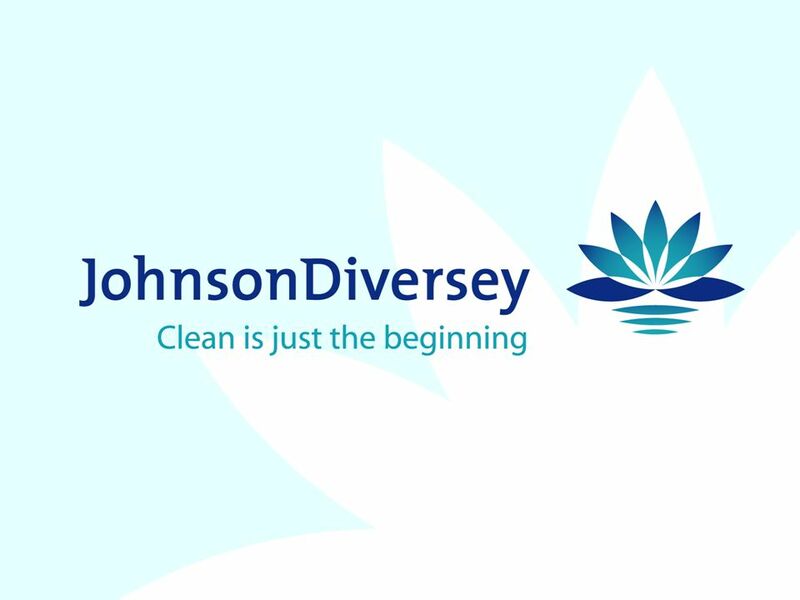 Developing Sustainable Supply Chains Mary Margaret Rogers Anderson School of Management University of New Mexico. Payment for Environmental Services Extracted from work by Ffemke Griffoen FAO-APO TZ. A Commitment to Community. Mission Statement Provides comprehensive, long-term solid-waste solutions in a safe, responsible, economically sound manner. Energy Efficient, Sustainable Detroit December 9, 2010 Randy Leslie, Vice President & General Manager Ford Business Unit Johnson Controls. 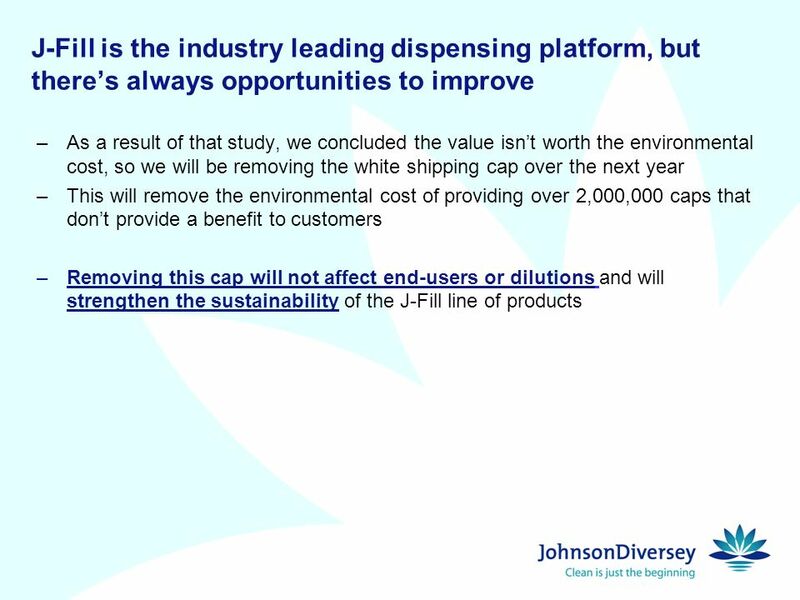 1 Paint Product Stewardship Initiative Issue Discussion. 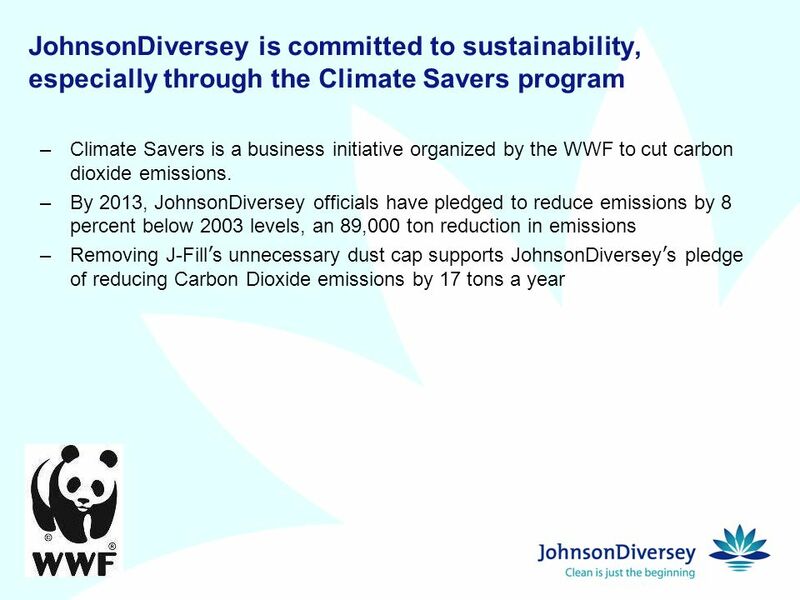 Sustainability is Good for Business HOUSEKEEPING DEPARTMENT. KEEN4 Green Corner Tips: 10 tips to help you drive greener.